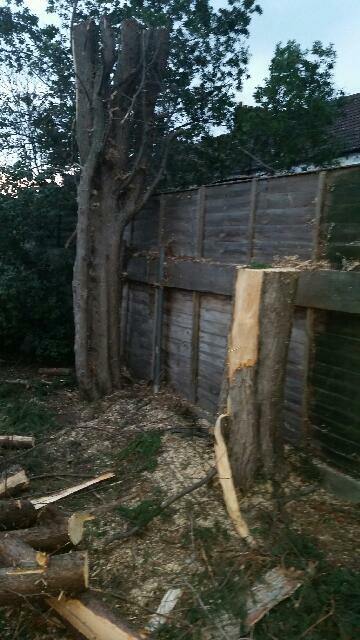 Cowboy Tree Surgeons strike again! I’m sorry to report that we were asked by one of our clients to go and clear up this mess that was left at their mothers house in Fulham. Unfortunately the lady, Jean, had agreed to allow some guys who called themselves tree surgeons to remove four trees in her rear garden having knocked on her door. They agreed a price of £850 and started straight away. However they were not finished by 5 o’clock and said that they would be back the next day. They asked Jean for £700 in cash to cover their costs for the day and that they would return to clear up and presumably collect the reaming £150. 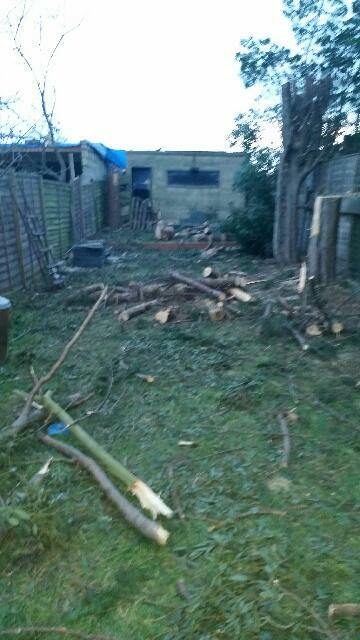 However, they did not return and left a huge amount of wood and debris in the garden. They broke 3 fence panels, the neighbours bench and gate. They left logs that they had tried to hide behind the garage and various debris and branches in the several of the neighbours’ gardens. Unfortunately, our client had no company name, address or point of contact for them and was extremely upset that she had allowed herself to be victimised in this way. Our professional tree surgeons assured her that she is not the first, nor will she be the last to be ripped off like this and we told her that these people can be very charming and that they make a very good living from convincing people that they can be trusted with this work. I’m fairly sure that she will not be answering the door to unsolicited service providers in the future.